Thanks for your constant effort giving us such great mods. I really appreciate it. Simply Thanks! Are you planing to built a cargo mod for the new freight market for ownable trailers? It would be really awsome. 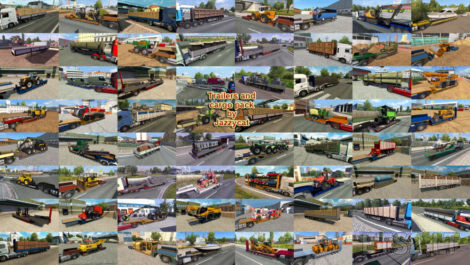 Your trailers and cargo mod and all the great traffic mods are an absolutely must have. Playing without them isn’t half as much fun. Thanks for this long await update. Thanks for the update but is this only me or have others too this errors in the game log when using this trailer mod. 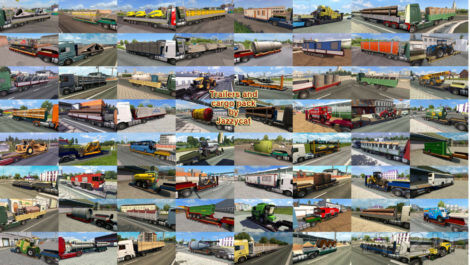 Without this mod there aren´t this issues. 00:51:26.390 : Ignoring proto with failed segment assignment. 00:51:27.889 : Ignoring proto with failed segment assignment. 00:51:28.237 : Ignoring proto with failed segment assignment. 00:51:29.188 : Ignoring proto with failed segment assignment. 00:51:29.189 : Ignoring proto with failed segment assignment. this is only a small part, the log is full with this………. Problem in game engine after last patch, not in pack. On Linux game version any value higher than 10 crashes the game right at the end of loading screen and lower values, as expected, dont help. Do you have any other solution pls? thank you JazzyCat. 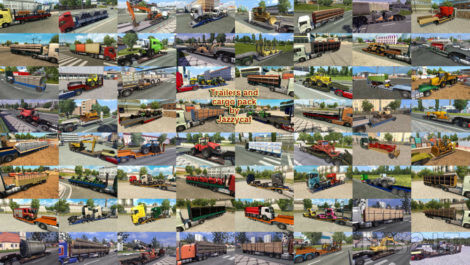 not possible to set yours mods on the workshop Steam ? for auto update please ? Dear, I can’t seem to get the 3rd file unzipped. I get the message “unexpected end of data”. I tried redownloading it from Modsbase and Sharemods, but with the same result. 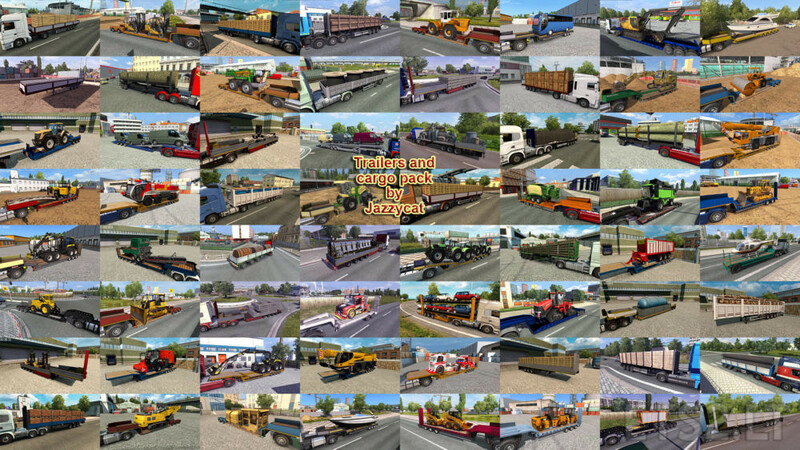 Hi, tried this mod, seems to be a conflict as some of the vehicles appear to be missing their bodies trucks and cars , also in roadworks lights flash but do not show the poles on which they stand, Malc. I’m not sure, but I think you might have the wrong load order for the mods? I had the same problem as you, but now it’s ok. This is the load order I have it now. Ok Malcolm, I turned off all my trailer mods from SiSL’s. And once again the game looks ok. But I only tried it for about 5 minutes, so I’m not absolutely sure. I’m so sorry Malcolm, but the problem is still there. For a while it seemed ok, but once i drove into the city Walcz it returned. Can anyone confirm compatibility with the recent 1.33 update?